Located in one of Chester’s most popular suburbs, this three-bedroom semi-detached property has more to offer than meets the eye. With great motorway links, schools, shops and public transport links all on the doorstep there is no compromise when it comes to this family home. Benefitting from a rear extension, there is ample, flexible living space, character features throughout and a private rear garden. Entering into the hallway, a staircase raises to the first floor and doors give access through to the kitchen and reception rooms. The lounge is bright and airy, benefitting from a feature fireplace and those lovely picture rails which continue throughout the property. To the rear there is an open plan dining area/sitting room coming complete with a multi-fuel burner and patio doors which lead out to the rear garden. The well fitted kitchen has an additional breakfast bar area and ample work top space. 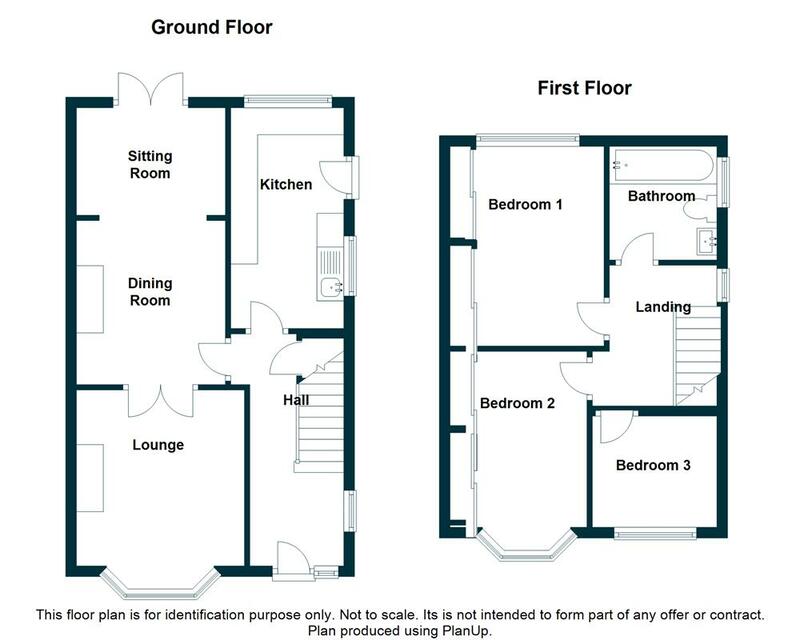 To the first floor there are three good sized bedrooms, the larger two fitted with built in wardrobes, providing that all important storage space. The recently installed bathroom is fitted with a three-piece white suite and attractive tiling. The exterior of the property has been very well cared for and offers both lawned and paved patio areas. If you are looking for a family home to suit all, then this property is one not to be missed! Vicars Cross is a popular Chester suburb just over a mile to the east of the city. There are shops for everyday needs on Green Lane where there is also a petrol station, dental surgery, primary school and library. The city centre is easily accessed by car, by local transport or on foot and provides a wealth of social, leisure and shopping outlets. Access to major A roads and the motorway network is within one mile and nearby supermarkets include Sainsbury's, Aldi and Waitrose. So to summarise, there's pretty much everything most of us could need within a reasonable distance! PVC entrance door with frosted glass inserts, and adjoining frosted glass window. Additional PVC frosted window to the side elevation. Spindled staircase rises to the first floor, with under-stairs cupboard which houses the central heating boiler and provides additional storage. Wood effect flooring. Concealed radiator. Telephone and power points. Picture rail and wall light point. Internal doors open into the kitchen and living space. PVC walk into bay window to the front elevation. Feature fireplace. Oak effect laminate flooring. Radiator. TV aerial and power points. Picture rail and ceiling light point. Oak glazed double doors with glazed side panels open into the dining/sitting room. PVC French doors open out onto the rear garden. The dining room enjoys an open fire set on a black tiled hearth, with wooden surround. Oak effect laminate flooring. Radiator. TV aerial and power points. Picture rail and two ceiling light points. The kitchen is fitted with a comprehensive arrangement of wall and base units, incorporating drawers and cupboards. The roll-top work-surface houses a stainless-steel sink with drainer and mixer tap. Tiled splashbacks with inset power points. Space for range style cooker with stainless-steel extractor hood over. Space and plumbing for washing machine and dishwasher. Space for dryer and under-counter fridge-freezer. The kitchen benefits from a useful breakfast bar seating area. Tilled flooring. Two ceiling light points. Two PVC windows to the side and rear elevations. PVC glazed door provides access to the rear garden. Frosted PVC window to the side elevation. Spindled balustrade. Power points. Picture rail and wall light point. Internal oak doors open into the bedrooms and bathroom. PVC window to the rear elevation. Fitted wardrobes with glass sliding doors provide hanging and shelving facilities. Radiator. Telephone and power points. Picture rail and ceiling light point. PVC bay window to the front elevation. Fitted wardrobes with glass sliding doors provide hanging and shelving facilities. Radiator. Power points. Picture rail and ceiling light point. PVC window to the front elevation. Radiator. Power points. Picture rail and ceiling light point. The bathroom is fitted with a modern white three-piece suite to include a panelled bath with electric shower over and glass shower screen. Low level WC with dual flush system. Contemporary square wall mounted washbasin with vanity unit below. Majority tiled walls. Hatch providing access to loft space. Extractor fan. Oak effect laminate flooring. Chrome heated towel rail. Ceiling light point. PVC frosted window to the side elevation. The property is approached via a driveway which provides off-road parking for two vehicles. The front garden is enclosed by panelled fencing and hedgerow screening, with access to the rear garden gained via a gated side entrance. The good sized rear garden benefits from a paved patio seating area surrounded by a low-level wall. There is a designated lawn with block paved stepping stones and gravel pathways leading to a further patio seating area. The garden has well stocked planted borders and hardstanding for a garden shed, all being enclosed with a combination of hedgerow and panelled fencing. Proceed out of Chester along the A51 Boughton and continue out of the city over the canal to the traffic lights at the Shell garage and turn left onto Green Lane. Continue along Green Lane, taking the second right on to Shaftesbury Avenue, follow the road around to the right and the property will be seen on the left hand side. Carman Friend for themselves and for the vendors or lessors of this property whose agents they are give notice that: (i) the particulars are set out as a general outline only for the guidance of intending purchasers or lessees, and do not constitute, nor constitute part of, an offer or contract; (ii) all descriptions, dimensions, references to condition and necessary permissions for use and occupation, and other details are given in good faith and are believed to be correct but any intending purchasers or tenants should not rely on them as statements or representations of fact but must satisfy themselves by inspection or otherwise as to the correctness of each of them; (iii) no person in the employment of Carman Friend has any authority to make or give any representation or warranty whatever in relation to this property. View or download the Energy Performance Certificate for Shaftesbury Avenue, Vicars Cross, Chester.